Bidoof in game: 4,535 Who? Important notice! 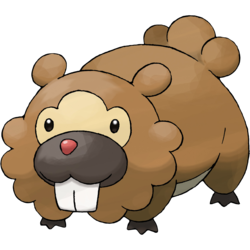 Pokemon Bidoof is a fictional character of humans. Bidoof (Japanese: ??? 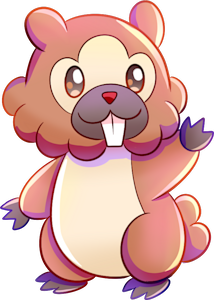 Bippa) is a Normal-type Pokémon introduced in Generation IV. 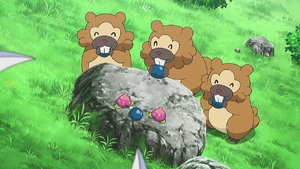 Many Bidoof appeared in Faced with Steelix Determination where a Steelix terrorized their village after Team Rocket accidentally stuck three shovels into its head. The shovels were removed through the combined efforts of multiple Bidoof, Ash's Staravia, and his Pikachu. A Bidoof appeared in the anime Special Pokémon Mystery Dungeon: Explorers of Time & Darkness and Pokémon Mystery Dungeon: Explorers of Sky - Beyond Time & Darkness as a member of Wigglytuff's Guild. A Bidoof appeared in The Clumsy Crier Quiets the Chaos!. A Bidoof appeared in A Fork in the Road! A Parting of the Ways! under the ownership of Beatrice. Bidoof made its anime debut in brief cameos in Following A Maiden's Voyage!, appearing in the wild. A Bidoof also appeared in One Big Happiny Family! in Jessie's fantasy. 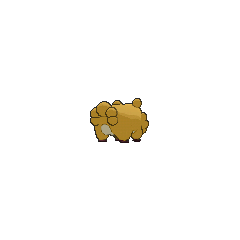 Three Bidoof were also seen under Reggie's care in Lost Leader Strategy!. It made another appearance in Saving the World From Ruins!. Bidoof, with its evolution, made a brief appearance in Giratina and the Sky Warrior. A photo of a Bidoof appeared in The Four Seasons of Sawsbuck!. A Bidoof appeared in a flashback/fantasy in The Forest Champion!. Multiple Bidoof appeared in Facing the Grand Design!. A Bidoof appeared in Making Friends and Influencing Villains!. Platinum was attacked by a group of Bidoof in the penthouse of a Jubilife hotel that she owned. Diamond was able to figure out a way to stop the attack. Yu Shirogane caught a Bidoof when he was training his Pokémon to defeat Shin. Boosts damage done by combos if the foe is asleep. Bippa is a combination of beaver and ??? deppa (protruding tooth). Mandarin Chinese ??? Dà Yá Lí ?? means big teeth. ? is derived from ? ?.